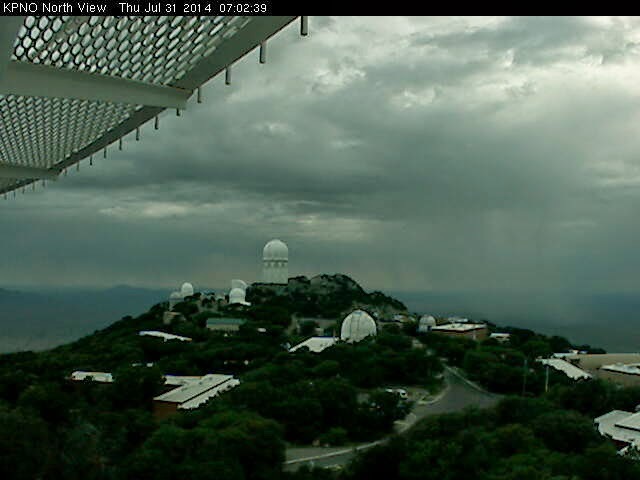 Around 7 am MST this morning the Kitt Peak webcam (above) showed a light shower to the north. Visible satellite image from about same time below indicates widespread debris cloud over much of northern Mexico and the Southwest. So while moisture is on the increase, big question for today will be how long the thick cloud cover will persist. The morning sounding from TWC on campus (above) continues to indicate a fairly dry surface layer, with cloud bases at about 600 mb. Winds aloft are currently light and variable below 300 mb. The latest NAM however forecasts two centers within the 500 mb anticyclone to become better defined by evening - one near the Big Bend in northern Mexico and one over southern California. Southern Arizona ends up in the circulation around the western lobe of the anticyclone, while a fairly distinct trough separates the two centers. 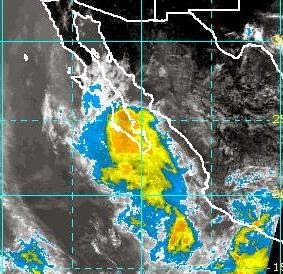 Picture may be complicated by any MCVs left behind by the MCS over Sonora. I have looked at both the NAM and GFS driven variants of the early WRF model forecast. The two versions have dramatically different forecasts for eastern Pima County. Both versions seem to allow too much sunshine too soon. The WRF-GFS forecasts storms in eastern Pima County during mid to late afternoon, but the NAM version does not. Interestingly, the NAM version does not convect much until during the night and early morning hours, when storms move into much of Pima County from the north. Above is WRF-NAM forecast of composite radar echoes valid at 1 am on August 1st. The accumulated rainfall forecast by the WRF-NAM through 6 am MST tomorrow morning is shown below. The bulk of the rainfall over Pima County is forecast to occur after midnight - a very interesting forecast by the model. At this time I would favor the NAM version, given the adjustment of the 500 mb anticyclone that is underway, the heavy morning cloud cover, and its delay of storms for the metro area until tonight. But, will be of interest to hear what Mike Leuthold finds in the new runs from this morning. There was a considerable increase in activity over southeastern Arizona yesterday, with some thunderstorms making it into parts of southern metro area. Dusty outflow from south here at house during late afternoon. Plot above shows CG flash locations through 0730 UTC on July 31st. Composite radar echoes below are from 0043 UTC (5:43 pm MST) yesterday afternoon. A large, upper-tropospheric cyclone moved across Mexico the last two days and is centered just west of the south end of Baja this morning. Upper flow to the north of this feature has been highly difluent and activty in western Mexico has been on the increase. The IR image above shows a larger MCS over Sonora at 0615 UTC this morning. Debris showers from this system (see 1200 UTC radar below) and heavy middle and upper-level cloud cover were over much of southern Arizona at sunrise. During my morning walk there were some light sprinkles, and I thought I heard one distant rumble of thunder far off to west. Rainfall for 24-hours ending at 7:00 am MST shown second below from MesoWest at University of Utah. Yesterday the PW did drop during the afternoon as per the early WRF forecasts, but not as low as model had indicated. Five day time-series of GPS PW near NWS Office on campus above shows that values have held between 1.25 and 1.60 inches through the period. The CAPE by 00 UTC yesterday was gone and during day thunderstorms stuck to higher elevations as per CG flash locations through midnight last night - below. 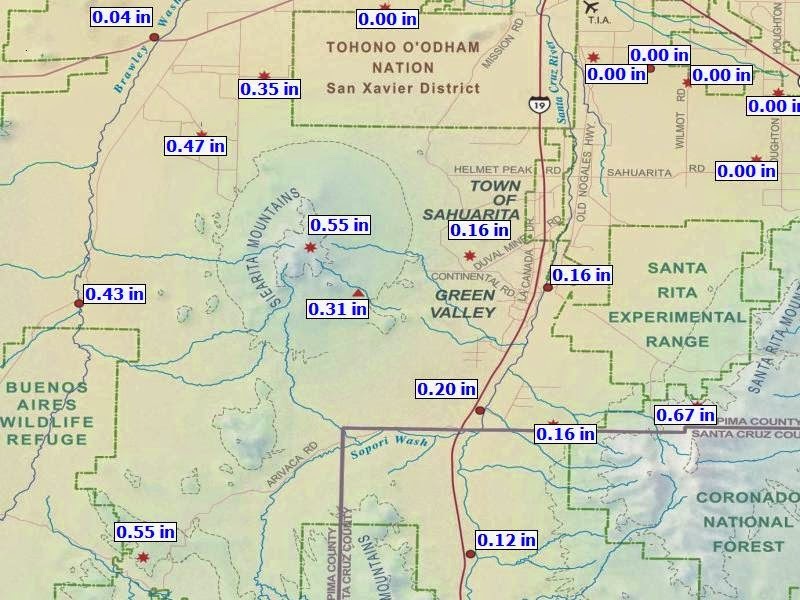 Several storms in southeast Arizona did produce some decent rain amounts due to their slow movement - MesoWest rainfall second below for 24 hours ending at 7 am MST this morning. The strange 500 mb pattern continues with northern and southern circulation centers within the large ridge over the West. Westerly winds across central part of West dominate between the two anticyclone centers. The forecast above for 500 mb is valid at 00 UTC on 1 August and is from this morning's NAM forecast cycle. As the trough over eastern portion of country deepens, the ridge is displaced westward and the forecast indicates the anticyclone centers shift to southwest Arizona and Idaho. This is certainly not a very good pattern for southeast Arizona - unless the low-latitude disturbance off Baja would trigger a significant increase in PW into the Southwest. July here at the house has been very dismal, in spite of the early onset of storms. Looks like this may be the 4th driest July here during the past 15 years. Yesterday was almost totally suppressed across southeastern Arizona, as was foreshadowed by the stable sounding yesterday morning. Chart above is 24-hour rainfall from MesoWest ending at 7 am MST this morning - July 29th. This morning PW values across southern Arizona are around 1.25 to 1.50 inches; however, the early WRF-NAM forecast indicates some drying over central and eastern Pima County, with values falling to around an inch by 7 pm this evening (above). The forecast sounding for 7 pm (below) at TUS indicates almost no CAPE, as well as very light westerly winds through the troposphere. The model forecasts storms for the next two days to remain east and south of the Tucson area. The main question I have about today's early WRF is whether it might be too dry locally. The forecast sounding for this afternoon indicates a BL mixing ratio of 8 g/kg. The morning sounding here has a residual BL with mixing ratio of 11+ g/kg. The only way that I can modify the observed sounding to get the forecast mixing ratio is to bring drier air from above 700 mb down into the BL. This may occur due to subsidence, given our proximity to the mid-level, southern lobe of the anticyclone. The new 12 UTC NAM forecast from the NWS seems to move some morning activity over northern Mexico into southeastern Arizona this afternoon. So all of this leads me to await the new WRF runs from atmo. 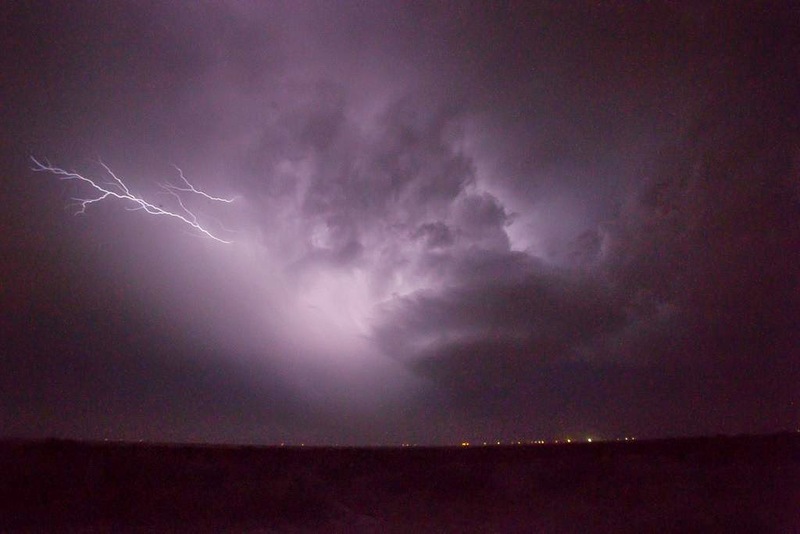 Photo of storm and lightning near Wilcox, Arizona, on Saturday night, by Mike Olbinski of Phoenix. See his web page at link below. Quite a different afternoon and evening yesterday, with southern Arizona storms mostly in Cochise County and White Mountains - above shows CG flashes for 24 hours ending at 6 am this morning (July 28th). Graphic below is from MesoWest (University of Utah) and shows rainfall reports for 24 hours ending at 9 am MST this morning. Note some embedded heavy amounts among the generally lighter reports. Storms were especially heavy from Douglas to Sierra Vista area. Across the ALERT network 45 of 92 sites measured rainfall - amounts mostly light and over the eastern portions of the network. Although storms produced strong easterly outflow gusts across the metro area of 30 to 40 mph, there was little new development at lower elevations. Quite a bit of lightning visible here at house but only a Trace of rain. The NHC upgraded Hernan to a hurricane briefly last evening, but this morning the storm has weakened and has a very disorganized appearance on the 13 UTC IR satellite image above. Hernan appears to have come just close enough to south end of Baja to keep the feed of low-latitude, moist air continuing northward into Southwest and West. This morning there is widespread debris cloudiness drifting over much of West and also Mexico. Finally, the morning skewT plot of latest Tucson sounding is shown below (from University of Wyoming upper-air page). Sounding continues moist, but with strong cooling from last evening stabilizing low-levels. note also the very chopped-up and strange vertical profile of winds. A weak, west-to-east, shortwave in middle-levels has established itself with the broader scale anticyclone and winds at steering levels are westerly. It appears that this will persist a couple of days, as the anticyclone develops distinct centers far to the north and also over northern Mexico. Certainly not a good pattern for storms here in north part of town - so big question becomes one of whether we'll get another decent rain here at house before the month draws to a close. Also at Atmo and Mike L. says WRF runs will be late. Problems unrelated - I think. There were so many severe thunderstorms yesterday across Arizona that I can not cover everything in a single post. The various models run from 12 UTC data did not forecast the events well, although the WRF-GFS from Atmo forecast the early stages of the MCS that developed along the Borderlands. However that MCS was still going strong at sunrise this morning. The 0330 UTC (8:30 pm MST) IR image above, that I grabbed before I went to bed, indicated the potential for storms continuing through the night - especially given the soundings from Tucson and Phoenix at 00 UTC. 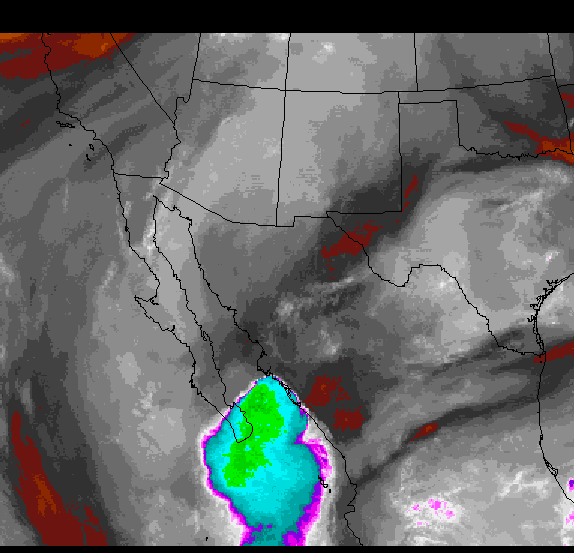 The IR image below is from 12 UTC this morning and the southern MCS has moved out into southwest Arizona. The northern MCS moved rapidly across parts of Maricopa County, producing widespread wind damage across metro Phoenix. That MCS weakened rapidly out in west-central Arizona after midnight. The MCSs both developed in elevated terrain - one in the southern White Mountains and the other in the higher elevations of the Borderlands. Katie woke me up a bit after midnight night and we sat on the porch and watched a spectacular lightning show over the Catalinas, with nearly continuous flashes and rumbling thunder. The cores stayed on the Catalinas and that storm was off to the north edge of the southern MCS. We had only some light sprinkles here and there was just 0.01" in the gauge this morning. Graphic above shows CG flashes through 12 UTC this morning and illustrates the paths of the cores of the two MCSs very nicely. Plot of severe thunderstorm reports (all winds) from SPC this morning is shown below. The reports page lists over 20 separate wind events in Arizona, most of them in Maricopa County. The southern MCS moved across the most desolate part of the Sonoran Desert and likely produced severe winds out there too. The storms were high-based and produced more wind than rain it appears. 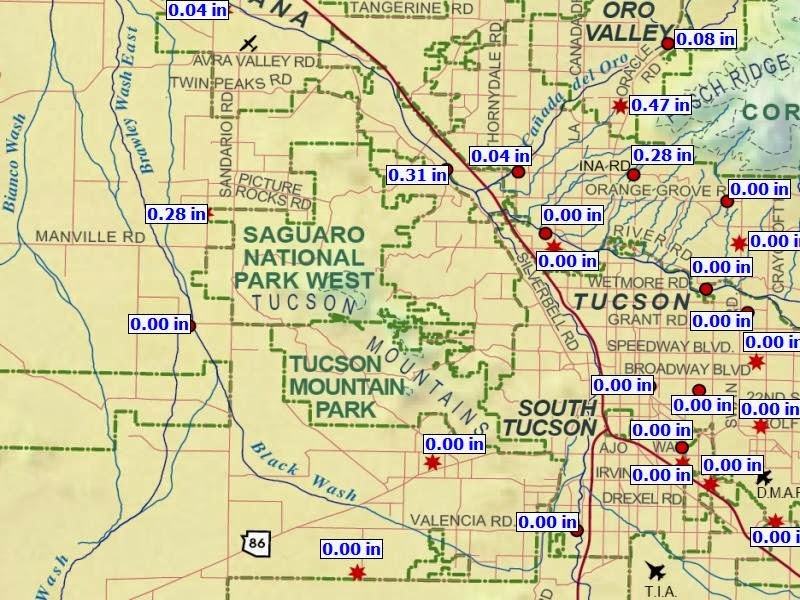 Across the Pima County ALERT network only 39 sites had rainfall during the night. There were 5 stations with over half an inch and Mt. Lemmon had just over an inch. The Catalinas sector is shown above at 6 am this morning and the southwest sector of the network is shown below. The air mass over Arizona is, not surprisingly, highly worked over this morning and both the Phoenix and Tucson soundings are not very representative of the larger-scale setting over the Southwest. 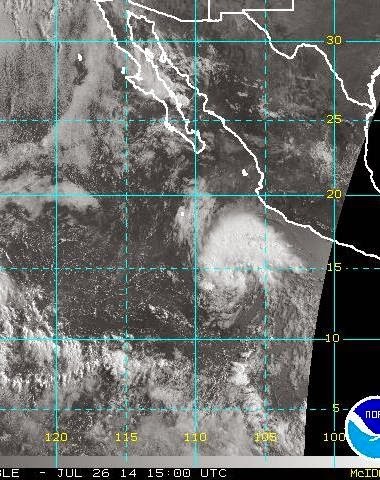 Tropical Storm Hernan is developing this morning south-southwest of Cabo Corrientes and is forecast by NHC to move a bit west of northwest and to remain at TS levels. During the past week or so, while I was distracted by other things, Fausto and Genevieve formed in the western portion of the Eastern Pacific. Tucson metro area was surrounded by thunderstorms yesterday, but the CG flash plot (above, ending at 07 UTC on 26 Jul) shows the well-known metro doughnut hole. Thick anvil spread across the skies from the storms to the south and shut things down. Tucson airport recorded a gust to 48 mph from the south, and this gust gust front seemed to bring back more of the morning dust. Some of the storms out to the west were severe and produced vivid lightning shows. Sasabe had a severe thunderstorm with a gust to 66 mph recorded at the RAWS station there. Phoenix had gusts to 46 mph with another dust storm moving across the metro area up there. Across the Pima County ALERT network 34 of 92 sites recorded rainfall, but none of the low-elevation metro stations did. Here at house we had dust and two very slight spits of rain. 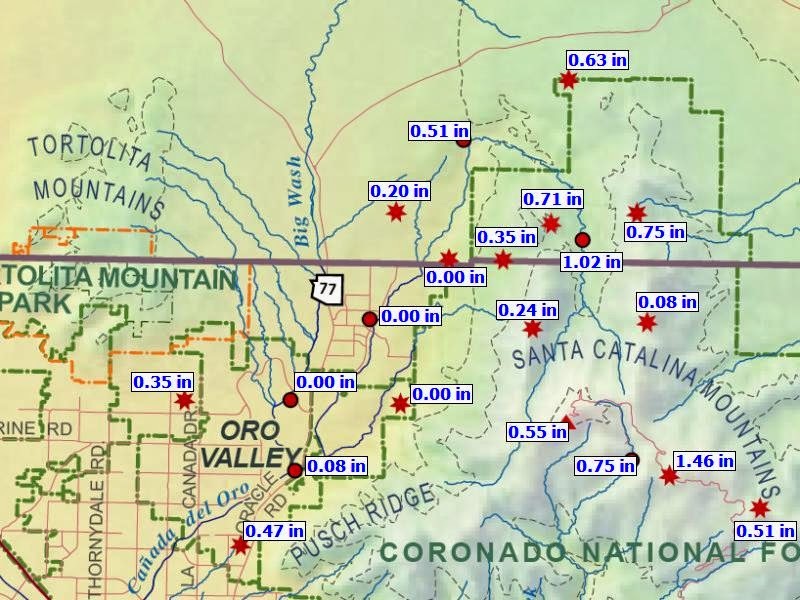 However, at higher elevations, especially in the Catalinas rains were heavier with 11 sites having over 1/2 an inch and 3 with over an inch. The rainfall through the 24-hours ending at 7 am this morning are shown below for the Catalinas and metro west sectors of the network. There was enough mountain rain for the Rillito Wash to be flowing some this morning. The skewT plot of the morning Tucson sounding is shown above. Fairly sharp cooling is indicated near the surface from yesterday's storm outflows. Skies are quite clear, and so this layer should heat-out, resulting in a deep, fairly dry afternoon/evening boundary layer (BL). The vertical wind shear is similar to yesterday, with anvils likely to spread ahead of storm cores. Not a favorable situation for the Tucson metro area. The early WRF-NAM forecasts storms late today but with most activity to the east and south. The El Paso sounding is quite stable this morning and warmer air in middle-levels appears to be heading this way from the east. All-in-all a fairly low-key day for late July. The WRF-NAM forecast for rainfall through midnight (below) forecasts a dying storm from Rincons to affect parts of the metro area during the late evening. Will be interesting to see if the new forecasts are more optimistic. The large MCS of yesterday (as per earlier posts) did push low-level moisture all the way north up the GoC and into the Southwest. This was a fairly rare MCS (based on my recollections of past 20 years or so) and it apparently produced substantial damage in southern Baja. The MCS outflow was enhanced by additional outflows from storms out to our west. 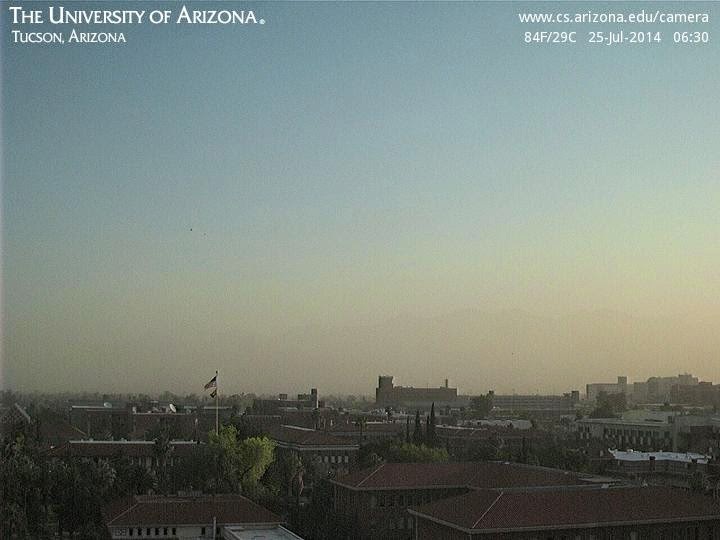 The result at sunrise (above) is very dirty skies with heavy, suspended dust, increased moisture and humidity, and very warm morning temperatures. The observations below are from the airport (TUS). Dewpoints across southern Arizona from Tucson westward are 20 to 25 F higher than the minimums of yesterday afternoon/evening. 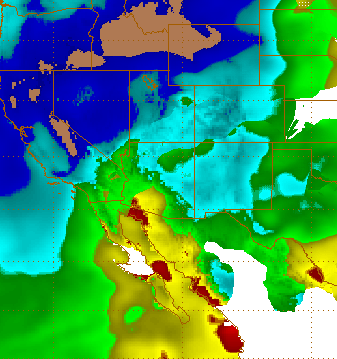 The CIRA blended PW analysis (above) for 3 am MST indicates values of 1.5 to over 2.0 inches over south-central Arizona. The plot of CG flashes through midnight last night (below) shows where storms occurred in a narrow south-to-north zone of moisture convergence between the easterly winds we experienced and southwesterly winds in the lower Colorado River Basin. There were no storms or rainfall across southeastern Arizona yesterday, just some cloud streets of shallow cumulus. I want to take a quick look the TUS morning sounding plot (above) versus the early WRF-NAM forecasted sounding (below) for essentially the same time and place. I'll look at the morning model runs later, after a morning appointment. First, the increase in low-level moisture has produced a dramatic increase in CAPE likely this afternoon. There is some cooling near the surface, but daytime heating should easily over come this. Observed PW was approximately 1.5 inches both for the observed and predicted soundings. Note that the model forecasts lifted parcels having theta-w of >24C ~ values greater than 24C often are associated with severe thunderstorms in this area. Now a bit of a negative - the time series of GPS PW from Tucson westward are indicating some decreases already, back toward 1.25 inches - so need to watch how this strange airmass evolves this morning. Finally, the observed vertical wind profile is very chopped up and essentially light and variable below 400 mb. The observed wind shear profile is not good at sounding time - indicating anvils spreading out rapidly ahead of storms that would be trying to move to the northwest. The forecast wind profile and shear is not as negative as that observed - my quick assessment is that a special sounding would certainly be nice to have today. Guaymas remains out of service - not good since that leaves a big data void exactly where we'd like to know more. From Luis Farfan in La Paz - streeting flooding in Cabo San Lucas produced by the large MCS. Jack Hales sent along two images from just before 14 UTC this morning - WV above and visible with some surface obs below. Note the gust to 46 mph north of Cabo San Lucas. 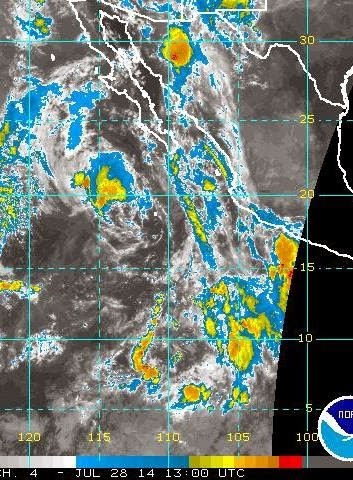 The MCS originated far to south along the coast between Cabo Corrientes and Puerto Vallarta last evening, and expanded dramatically during the night, while moving rapidly to the north-northwest. Currently the MCS is crossing Baja and weakening - IR above from 1730 UTC. Of note is that Loreto, Mexico, (see map below) also reported a gust to 46 mph, from the SE, on the last hourly summary - so definitely a very strong outflow moving up the GoC and perhaps into western Arizona by morning tomorrow? Models and forecasts were too optimistic for Tucson metro yesterday, as most storms were out to the west. The 00 UTC sounding from campus had just a tiny sliver of CAPE and there were isolated storms here and there in southeastern Arizona. Graphic above shows CG flash locations through midnight last night. Radar below is from 5:30 pm MST. The small storm to west of "T" in Tucson developed nearly over the house and produced 0.09" of rain here during brief but heavy shower. Across the ALERT network no sites measured rainfall through 5 pm yesterday afternoon. After 5 pm 16 sites had light rains, mostly over the southwest portion of network - see above. Areal coverage after 00 UTC was less than 20% - the 0.59" amount above was highest amount recorded in the network. The morning sounding from TUS is plotted above, showing a truly pathetic situation here this morning. The PW is back to around 30 mm and there is little to no CAPE likely during the afternoon. The 250 mb analysis for 12 UTC shown below indicates that the upper-level anticyclone is nearly overhead. So a lucky bit of rain yesterday for the house and now we'll continue to await the return of some mT air. Finally, there were several MCS events during the night from the central to lower GoC. The large MCS (IR image below is from 6:15 am MST) currently over the southern end of GoC has been moving steadily north-northwestward during the early morning hours. The MCS activity may push better low-level moisture into the lower Colorado River Basin. Bit Of An Upturn By Midweek?